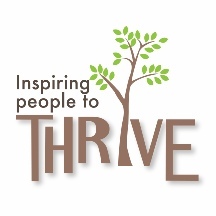 The Thrive Partnership brings together a group of organisations that have for many years delivered housing and support services in Telford & Wrekin with great passion and drive; working together to improve and develop innovative services for vulnerable people across the Borough. Thrive allows our members to make use of each other’s specialist expertise, experience and knowledge, sharing resources in an open and transparent manner to ensure we provide the best possible service to local people. Thrive was established in 2013 to ensure there is a co-ordinated local response to the needs of vulnerable people in Telford. The founder members of Thrive – Stay, Bromford Support, Maninplace, Wellington YMCA and The Salvation Army Kip Project came together out of a shared ethos and belief that with the right support, everybody has the potential to “Thrive”. Watch the video below to find out how Thrive has changed the lives of it’s customers.